Triggers are actions that run when changes are made to your data or when a new form submission is received. Use triggers to automatically send a follow-up email after ten days or set the status of a record to expired after a subscription period. Triggers are a flexible and extensible tool that open up a wide range of possibilities. Triggers can save you a ton of time and help put your business on auto pilot. Consider a trigger that runs when you update the shipped status of a record in your database and automatically sends the customer a tracking number and transfers the record to the 'shipped' table. 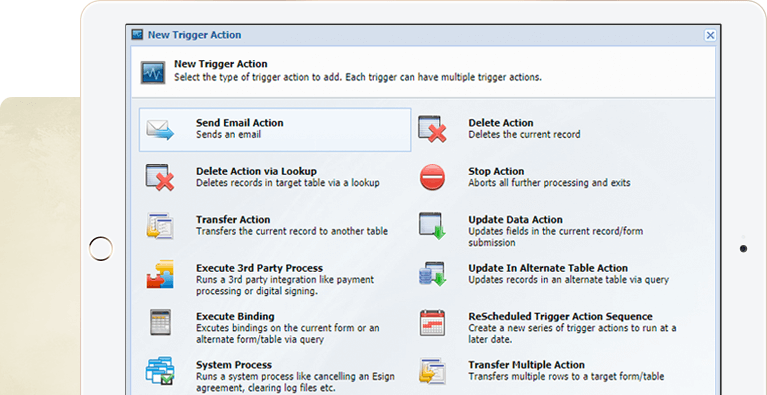 Triggers can also be used to automate business processes as documents get ESIGNED. The possibilities are endless. You can set up a series of trigger actions to be run at a later date. And the dates can be based on values on your form. You could, for example, set up an automatic reminder to be sent the day before an event your visitor registered for and automatically send a follow-up survey after the event! Send an email, transfer a record to another table, run a cascading update, integrate with a 3rd party payment gateway and more. Triggers are easy to use and provide a powerful tool to design your own custom functionality. Triggers integrate seamlessly into your workflows. Add a button next to each record in your work that can automatically call a trigger and run some actions. For example, your button could call a trigger that sets the status of the record to 'Approved" and automates an email to a manager to let them know an employee request was approved. You can even run triggers on a bulk selection of records using the table tools feature.